Happy 1st day of summer! The week’s Outdoor Jazz Schedule (All events are free unless otherwise noted) is appropriately active, topped by ComFest 2018 at Goodale Park – click here for the festival’s jazz schedule and see below for a preview. Outdoor live jazz is available downtown before ComFest on Friday, June 22nd thanks to the Pearl Market, which is being held on the lawn of the Statehouse this summer – See vocalist Anna Paolucci with guitarist Tom Davis and bassist Rob Sobnosky tackle a family friendly mix of fun tunes starting at 10:30am. The Dylan Bram and Gabe Koempel Duo bring their easy-going combo of vibes and guitar to the patio of Oscar’s of Dublin on Friday at 6pm – this event is canceled if there is rain. On Saturday, June 23rd, long-running avant garde jazz ensemble Honk, Wail & Moan joins a 3-band bill for a Summer Concert at the Delaware County Arts Castle at 4:15pm – more details here. The Local ‘n Live series at the Campus Gateway Beer Garden (outside World of Beer, which is the rain location) continues with upstart trad jazz outfit RedHotBux on Saturday at 6pm – more details here. Keep reading for info on Sunday’s outdoor jazz, a ComFest preview, and Too Many Zooz! Great jazz is available in our area parks on Sunday, June 24th, including the Dave Powers Trio playing a lively concert at the Inniswood Metro Gardens in Westerville at 3pm. A great selection of food trucks open at 4pm for the Bexley Jazz in the Park Series at Havenwood Park – See the simultaneously nostalgic and futuristic fusion of the Columbus Video Game Ensemble get underway at 4:30pm. The Westerville Sounds of Summer Concert Series keeps swinging with a Sinatra-inspired performance by Brian Michael Smith with the John Vermeulen Octet at the Alum Creek Park Amphitheater at 6:30pm. And finally, the Summer Concert Series at Clintonville’s Park of Roses Gazebo welcomes high-powered ragtime celebrators Dr. Tony’s Ragtime Band at 7pm. Another great weekend to get out and enjoy live jazz! After a strong trio of newer/emerging bands to open the I Wish You Jazz Stage starting at noon – Book Lites, Meghna & the Josh Hindmarsh Band, and Positive Energy – the Friday jazz schedule at ComFest is lighter than usual with a dose of blues programming. But there are still three festival favorites to be seen in the later hours – Columbus’ own 20+ years strong New Orleans-style brass band, New Basics Brass Band, at 5:30, veteran groove explorers fo/mo/deep with special guests at 8:35, and ChickenHawk BirdGetters, “the jazz offensive,” return after a controversial 2017 set to close the first day of the stage at 9:40. And if you need more, the BirdGetters will take the party to Brothers Drake afterwards – Their Post ComFest Offensive kicks off with the hip-hop flavored improvisation of Johnson Family Funk at 10pm. Saturday’s schedule offers a diverse full day of jazz on the jazz stage, starting at noon with a trio of sets by veteran performers – John’s Jazz Trio (Chief Johnny Lonesome), Kelly McLennan & a Coterie of Melodymakers, and ComFest tradition Circus of Cool. A late afternoon highlight is a soul jazz set by a quintet version of saxophonist Michael Kahn’s Soul Eyz project at 5:30, where he’ll be joined by Josh Hindmarsh – guitar, Jacob Campbell – piano, Roger Hines – bass, and Greg Bandy – drums. The day ends with another doubleheader of celebrated projects – keyboardist Lisa Bella Donna’s long-running fusion force Descendre hits the jazz stage at 7:40, followed by the only 2018 appearance by another festival tradition – a wild “trance/jazz” party from keyboardist Jim Maneri’s Flypaper at 8:50. The jazz lineup starts strong for the third day in a row Sunday with more timeless Columbus jazz celebrations starting at noon – Vaughn Wiester, Randy Mather’s Joe Diamond Tribute Band Rhinestone, and The JazzPoetry Ensemble. This triumvirate is followed by one of the last performances by Anna & The Consequences before Anna Paolucci leaves town, so catch some sassy torch blues and more at 3:30pm – learn more here! And of course, no ComFest is complete without organist extraordinaire Tony Monaco! Our own B3 bomber leads a trio to close the 2018 I Wish You Jazz Stage at 6:45. Happy ComFest! Friday, June 22nd (9pm – midnight): Too Many Zooz at The Columbus Athenaeum, Downtown. Dating to 1896, this historical site and emerging music venue plays host to a very exciting double bill. 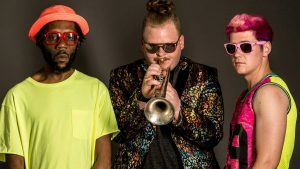 NYC’s Too Many Zooz, a “brasshouse trio” featuring saxophonist Leo P, trumpeter Matt Doe and percussionist King of Sludge, is a high-energy band similar in style to fellow “subway band” Moon Hooch. This will be an otherworldly dance party! Soulful Michigan rock band Joe Hertler & The Rainbow Seekers opens. Get your tickets here!